First, the setting is important. Villers-Bretonneux is, as Romain Fathi says on page 1 of his book, ‘a small country town … and the vast majority of French people have never heard of it’. (A French minister, visiting for a ceremony, even mispronounced its name.) The town had a population of 4500 in 1914 and it is about the same size now. It is about 25 kilometres from Amiens (population today about 133 000) and about 135 kilometres from Paris. Comparisons with Australia are, of course, difficult, but think perhaps Cessnock in New South Wales or Colac in Victoria. 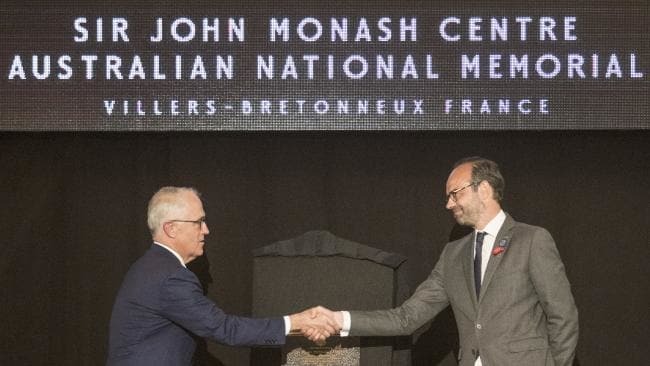 Why that comparison is interesting is that Fathi points out that Australians visiting Villers-Bretonneux since 1918 have transformed its inhabitants – or at least that minority of them who have cared about or fraternised with visitors from the Antipodes – into ‘the French’ who have ‘revered’ Australians. It would be a little like a French visitor to Cessnock or Colac assuming that the welcome received there could be translated into Australian attitudes to French people as a whole. Fathi starts from this odd transmogrification of Villers-Bretonneux and builds the edifice of his book thereon. Six chapters take us through the history of the relationship between Australians and Villers-Bretonneux over the century since the end of the Great War. Before these chapters, however, Fathi sets us straight about Villers’ place in the closing stages of the war. Essentially, he argues that Australian historians have overemphasised Villers’ importance in the conflict in the Somme in mid-1918, thus ‘presenting at times a very localised and biased account that has done little to increase overall understanding of the Great War’ (p. 28). ‘Much of the commemorative behaviour analysed through this book’, Fathi says, ‘shows that Australians come to Villers to watch themselves on a positive stage that they themselves, or other Australians, have built, assuming that the French and other nationalities approve of, or admire, their [Australia’s] national narrative’ (pp. 8-9). Australians have hyped Villers because Australians fought there, not because it was important. ‘This distorted memory of the fighting around Amiens from March to August 1918, passed on through newspapers, various self-advertising memoirs [including Monash’s], Bean’s official history and popular historians, has influenced the memorialisation of the Australian engagement at Villers-Bretonneux for a century’ (pp. 28-29). Chapter 2 of the book shows how Australians, in the first few years after the war, set the tone for what was to follow. It was difficult to aggrandise the Australian role in relation to Amiens – other Allied nations had plausible claims to having played pivotal roles there – so Australians focussed instead on the smaller target of Villers-Bretonneux, where other nations had less martial involvement to memorialise. Villers had seen a successful Australian engagement, fortuitously on Anzac Day 1918, which tended to counterbalance the disaster of Gallipoli three years before. Villers’ mayors went along with this Australian eagerness because of the benefits they saw flowing from the relationship. (Fathi refers to ‘an economy of gratitude’ (p. 42).) And so grew ‘the “historical importance” of Villers-Bretonneux as a site of Australian experience of the First World War in terms of fighting … the production of meaning and … remembrance’ (p. 42). Chapter 3 looks closely at a case study of this special relationship in ‘our corner of the Somme’, that between Australians and the local school, known since the 1920s as the Victoria School after it was built partly with donations from Victoria, although the town authorities would have preferred to build something else. The school was ‘a way to perpetuate the memory of the Australian engagement in the war in the mind of Villers’ future population’ (p. 61). ‘The school now appears’, Fathi concludes, ‘to be more of an imposed gift than an act of benevolence. Its building primarily served Australian interests, not those of the townspeople of Villers-Bretonneux’ (p. 71). Yet there the school sits, with its conspicuous sign, ‘Do not forget Australia’, erected in the 1980s when the number of Australian tourists to the town began to increase. Chapter 4 describes the building of the Australian National Memorial at Villers-Bretonneux and its opening in 1938. The gap of twenty years between Armistice and opening speaks, says Fathi, not just of financial constraints and bureaucratic dithering, but also of ‘a progressive return to asserting Australian national identity through an imperial frame and imperial symbolism’ (p. 77). People in Australia listened eagerly to the radio broadcast of King George VI unveiling the Memorial and then went in droves to the newsreel theatres to see the film. Chapter 5 takes us through the relative quiescence of Anzac through the 1950s and 1960s, a phase seen as much in France as in Australia. 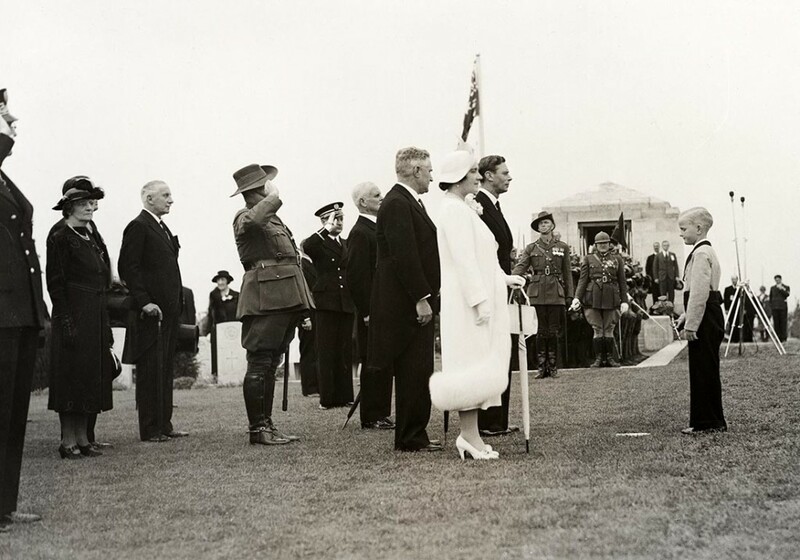 Anzac Day ceremonies at Villers-Bretonneux were small and simple; the Australian Ambassador to France did not always attend or, when he did, attracted interest more for his snazzy motor car than the purpose of his visit. Networks between Villers and Australia were maintained, however. Chapter 6 covers the 1980s and 1990s as Australia’s Department of Veterans’ Affairs (DVA) cranked up the commemorative machine, partly to make up for the decline of its workload in other areas as veterans died. ‘Villers-Bretonneux once again became a platform for commemorative diplomacy’ (p. 113) as representatives of the two countries met on the sidelines of Anzac Day ceremonies in the town. On the Antipodean side, ‘successive Australian governments rode on the historical interest expressed by a group of its people and progressively proposed an official narrative, varying slightly between ministers and prime ministers, to define Australianness through the Anzac experience’ (p. 134). DVA-sponsored memorials, plaques and ceremonies proliferated, as actual memory of the events they referred to diminished. Fathi inserts a pungent quote from fellow French historian, Pierre Nora, that ‘the less memory is lived from within, the more it needs external supports and tangible landmarks of an existence that only lives through them’ (p. 134). Chapter 7 shows how the symbiotic relationship between Villers-Bretonneux and Australians has matured in the last couple of decades, as the town became the most important overseas commemorative site outside Gallipoli. The chapter takes us up to the opening in 2018 of the Sir John Monash Centre, which Fathi has already written about for Honest History. DVA did the heavy lifting on the Australian side, while Villers officials remained on the lookout for local advantage. From about 2008, it was increasingly difficult for the locals to get a look in at commemorative occasions, as Australians dominated. Numbers at services grew, as Australian tourists took a strong interest in Villers and the adjacent Australian Remembrance Trail. Since the election of the Howard government, [Fathi concludes this chapter] Australian authorities have profoundly transformed commemoration at Villers-Bretonneux with a new narrative, new commemorative devices and new formats for commemoration. The associative and personal dimensions surrounding commemoration [that is, looking for family connections] have been replaced by an official presence that has designed commemorations to foster pride in Australian history. [These new features] insist on the Anzac spirit and “positive” values associated to Australian soldiers of the First World War, while other aspects of their service are ignored (p. 158). What a responsibility – or what a millstone – that creates for Australian governments. ‘The example of the Western Front suggests that it has become difficult for an Australian government in office to disregard the legend, so popular and significant has it become within the Australian community’ (p. 158). 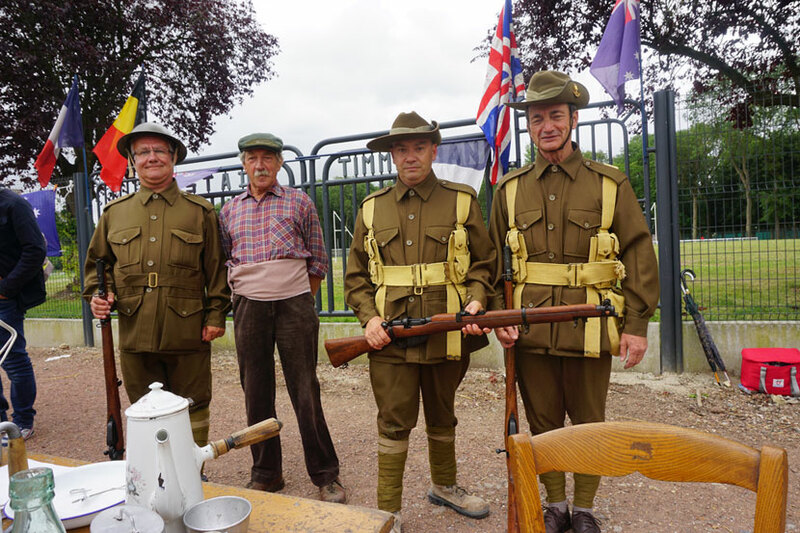 Residents of Villers-Bretonneux dressed up, 2015, a year when the Tour de France passed through Villers (Ride Media). The title of the Ride Media post is ‘Villers-Bretonneux: an Australian town in France’ and it quotes the Mayor to that effect. But what do the people think? Fathi’s chapter 8 gives us some cause to hope. Here he analyses samples of 30 000 comments in visitors’ books from the Villers-Bretonneux cemetery and the French-Australian museum in the town for years ranging from 1988 to 2013. He breaks the comments down into categories: remembrance, rest in peace, horticultural beauty (of the cemetery), family link, pride and patriotism, emotional impact, satisfaction, gratitude and sacrifice, comments against war, religion, and general observation. The number of categories reveal the complexity of Australians’ responses, but Fathi goes on to draw some important conclusions. He finds that jingoism ‘is not simply absorbed by Australian commemorants. The Anzac Spirit as manipulated and extolled by politicians and reproduced by popular history authors, mass media and through the internet is, for the most part, not evidenced by Australians when visiting Villers-Bretonneux’ (p. 194). Instead, the long view of Australians at Villers-Bretonneux shows ‘[a] strong emphasis is placed on the duty of collective remembrance, commemorating individual soldiers, and pride in these men, Australia and the nation’ (p. 194). Yet, there are caveats arising from the visitors’ book comments. There are also visitors (a minority) who seem to place themselves, rather than the commemorated man, at the heart of the commemoration. For them, ‘locating themselves within history and being part of the national history of Australia is part of an identity-making, or identity-discovering, process’ (p. 169). Secondly, the names in the books are so skewed as to validate ‘commentators’ intuition that the Anzac narrative in recent years was essentially very Anglo-Anzac’ (p. 183). There are fewer Italian, Greek or Polish-sounding names than would have been expected, given Australia’s modern make-up, and a total absence of names that would indicate an Asian, Arabic or African origin. 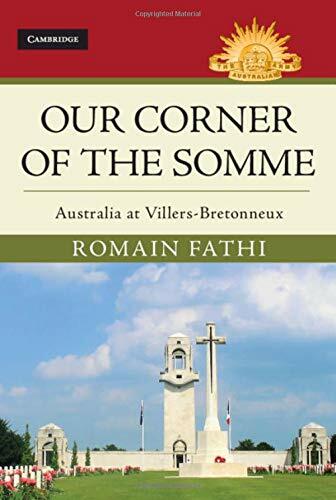 No-one perhaps has looked more closely at how Australians commemorate in France than has Fathi, now Lecturer in History at Flinders University, though his book may not sit well with the nostalgic pilgrims along the Australian Remembrance Trail. That will be a pity, because it should be required reading for all of them. For those who do carry the book, it will make a nice sturdy package – credit to Cambridge University Press and to the author, who provided many of the photographs – and there were only a couple of tiny clangers that I saw: a British King ‘Georges’ V on page 34; a Labor Veterans’ Affairs minister, Ben Humphreys, who loses the ‘s’ in his name between page 126 and page 131. The extensive bibliography attests to Fathi’s diligent research over a number of years. All in all, Romain Fathi’s interest in, and migration to, Australia is our gain. As Robbie Burns famously said, ‘O wad some Power the giftie gie us/To see oursels as ithers see us!’ It’s to be hoped that, Facebook trolls aside, Fathi’s view of us is widely read and appreciated – in Villers-Bretonneux but, more importantly, in Cessnock and Colac and the rest of Australia. * David Stephens is editor of the Honest History website and co-editor of The Honest History Book. His articles for the website can be found through our author listing.